Nekro-Nancy of the Vicious Dishes gives a small taste of this weekend’s excitement as Tri-City Roller Girls open their season. his Saturday won’t be anything less than fantastic! The Vicious Dishes and TKO’s respectively have been awaiting this moment. With both teams having a new line up of not-so-fresh-anymore meat who are just itching to put the last year of intense training to use, it is sure to be an exciting game for anyone watching! There will be new faces at the jammer line that have not been seen by our fans before, there will be new styles of hits that will knock the wind out of the fans, and the other player, of course. The Dishes also have a new coach, Shamis, who has brought many new plays and ideas to the round table having coached for an assortment of teams and sports over the years. Needless to say, the fans are going to see something they’ve never seen come out of TCRG, not only newly drafted players, but coaches, captains, new contests and of course, no more minor penalties! This game will keep everyone on the edge of their seats and toe stops as no one will be able to predict what’s coming next! Click on the link for a chance to win tickets to the home opener: TICKETS. Thunder Games was the theme of the night at New Hamburg Arena. The Lake Effect Furies from Queen City Roller Girls [from down in Buffalo, New York] blew in north in a return grudge match against the Thunder of Tri-City. One year ago, I was knee-deep in orientation classes for my Masters of Counselling program with Athabasca University. One year ago, I would have never imagined what was lying ahead of me in the months to come, aside from schoolwork. I was working at a law office in London, Ontario in the spring of last year when I saw an ad in my local Woodstock newspaper looking for skaters to try out for a new Roller Derby team being formed in the community. I was immediately interested, but fearful, since I had never even seen a pair of quad roller skates, let alone wore any. However, I had many, many years of experience on roller blades, and since the ad indicated that roller-bladers were also welcome to attend, I decided to give it a try. 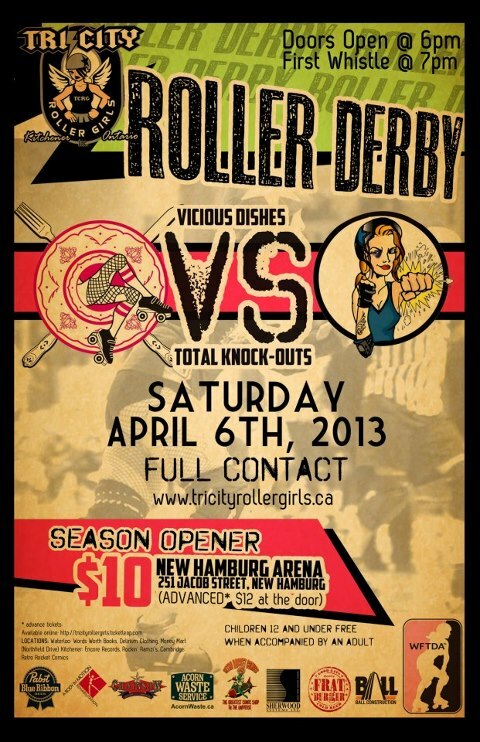 Around the same time, my best friend Sandra, from Stratford, had told me that she was planning on attending a Fresh Meat boot camp with Tri-City Roller Girls (TCRG), so I decided to go with her. 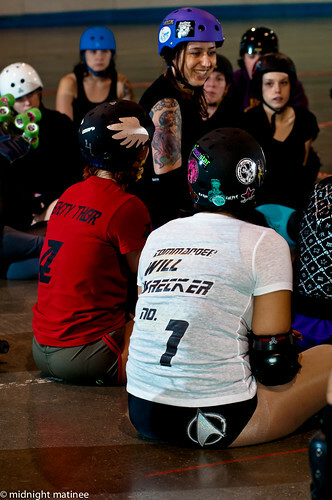 On day one of this fresh meat boot camp, I was immediately shown the different calibre of intensity, strategy and professionalism that is associated with a well-established and successful roller derby league. It was intimidating as a new and unskilled skater to be surrounded by such a talented and intense group of athletes; I truly felt at the time that I was nowhere near ready for such a level of gameplay. So, I focused solely on practicing for Woodstock where the climate was less intense. 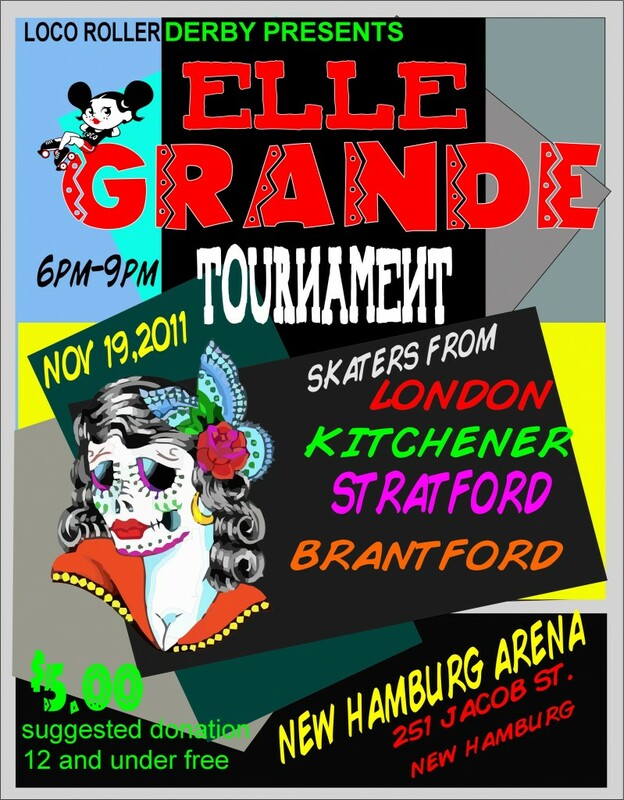 fter a month of skating solely with Woodstock, and after playing in the Fresh and Furious: GTA Drift tournament in Toronto for fresh meat players and leagues, I attended a game in New Hamburg with my husband, Justin. Upon entering the venue, we were immediately greeted by Leigh-zzie Borden and Fox Smoulder, the trainers of the TCRG boot camps I had attended over a month prior to this interaction. These two ladies remembered me immediately and urged me to return to the fresh meat boot camp. They understood my nervousness and my intimidation but were incredibly sympathetic and encouraging. Both of these fabulous ladies made me feel welcome and wanted, and who could say no to such courtesy? So, I opted to leave my local comfort zone of Woodstock and join TCRG full-time. 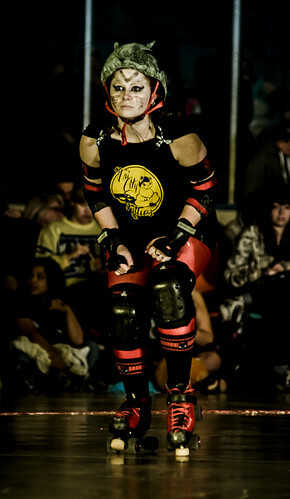 Once the switch was official, I committed 100 percent to TCRG and to myself. Determined to get better, day by day, at home I would put my skates on and practice my toe-stop walks, my tomahawk stops, transitions, and so on. On the weekends, I would attend ANY open skate I could to simply just spend more time on my skates. I attended every TCRG bout to watch and study the skilled athletes that I now have the privilege to call friends and family. Within two month of this switch, I was ready to complete my official minimum skills testing with confidence. Those two months were cram packed with endurance, high intensity training and, of course, as all derby girls know, much sweat and tears. As fate would have it, in August of last year I passed my official testing and then became eligible for the TCRG draft. September, I began my Masters of Counselling degree and shortly thereafter, tragedy struck my family. My father passed away on September 16, 2012 of Cancer. He was only 52 years old. I took a couple weeks off from practice and from school to handle visitation and memorial arrangements and during this time, my inbox and my cell phone erupted with messages of condolences and positive energy from many members of TCRG. Upon my return to practice, my fresh meat group presented me with a condolence card signed by every member. This kindness touched my heart greatly and definitely reaffirmed my feelings of belonging and showed me that, despite my loss, I had a whole new family who genuinely cared for me. In October, all Fresh Meat girls who had passed their minimum testing were asked to submit an e-mail outlining their team preference for the official draft to be determined by December. I responded to this request by submitting a blanket preference for any of the three teams: Vicious Dishes, Venus Fly Tramps and Total Knock-Outs. All I wanted was to play for TCRG, I would be happy and honoured to be placed on any of these fantastic teams. While we awaited the draft, Fox Smoulder and the training committee arranged for us fresh meats to play our first game versus Niagara Roller Girls. The game was named Puppies vs. Kittens with proceeds going to the KW Humane Society. The Tri-City Kitties, my team, dominated the short match by a score of 85-15, and could not have ever dreamed to do so without the stellar teaching from the training crew of Tri-City Roller Girls. As luck would have it, on December 4, I was invited by Suzy Slam and Cleothrashya to join the Vicious Dishes for the 2013 season. I was thrilled and nervous to be invited to the team that won Beast of the East in 2012, but I realized that this invite will surely force me to up my game and my intensity. I know that in the months to come, I will be pushed and will push myself to improve and justify their faith including me in the amazing Vicious Dishes. 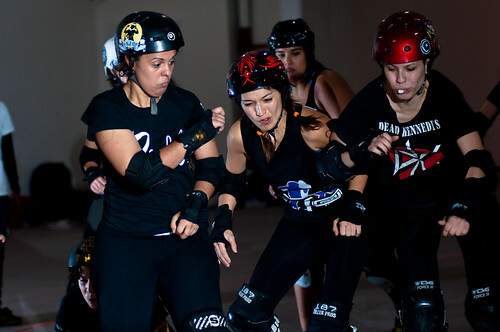 I am confident that these ladies will hone me to become a force to be reckoned with in the roller derby world. I truly feel as though the choice to commit to TCRG was likely the best choice I could have ever made for myself as I have never felt more like a part of something than I do now. These women have truly touched my heart and shown me what real teamwork is all about. We are a family here and have each other’s backs, always. I wish that more people could experience roller derby the way that I have and I truly hope that all people associated with or are considering becoming part of a roller derby league, feel the same derby love for their league that I do. That being said, I would hope for more people to become involved in the fantastic world of Roller Derby, no matter where or which league. 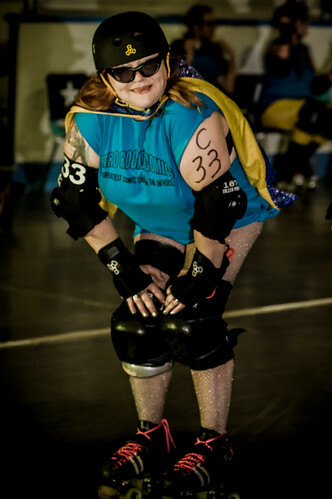 Tri-City Roller Girls will soon be starting up the Fresh Meat Boot camp for 2013, visit http://www.tricityrollergirls.com or e-mail TCRGfreshmeat@hotmail.com for more information. I look forward to seeing all of you on and off the track for this upcoming 2013 season!!!! Just ahead on January 26th at Tri-City: No Minors? No Problem! A No-Minors Bootcamp. Go to the website for more details. Why don’t you put some skates on and be your own SuperHero?